Denton True "Cy" Young (March 29, 1867 – November 4, 1955) was an American baseball player. He was a pitcher for five different professional baseball teams from 1890 to 1911. He set many pitching records during his 22-year career in Major League Baseball (MLB), some of which have stood for 100 years. When Young retired from baseball, he had won a total of 511 games in his career, the most in MLB history and 94 more wins than Walter Johnson, who is second on the list. In 1956, the MLB created the Cy Young Award. The award is given each year to the pitcher who is voted the most effective in each of the two leagues. Young was voted into the Baseball Hall of Fame in 1939. During his professional career, Young won 30 or more games in a season five times, with ten other seasons of 20+ wins. He also pitched three no-hitters, including the first perfect game of baseball's "modern era." In addition to wins, Young holds the MLB records for most career innings pitched (7,355), most career games started (815), and most complete games (749). He also retired with 316 losses, the most in MLB history (the only other pitcher with more than 300 career losses was Pud Galvin). Young also had 76 career shutouts, the fourth most in history. In 1999, 88 years after his final Major League appearance and 44 years after his death, editors at The Sporting News ranked Cy Young 14th on their list of "Baseball's 100 Greatest Players". That same year, baseball fans named Young to the Major League Baseball All-Century Team. Young was born in Gilmore, Ohio, a farming community in eastern Ohio. Young went by the name "Dent Young" in his early years. He was raised on a farm and was sometimes called "Farmer Young" and "Farmboy Young". Young stopped going to school after he finished 6th grade. 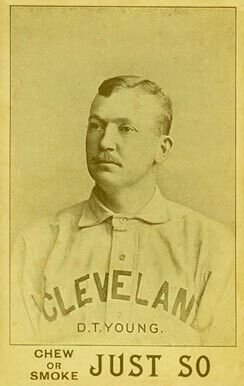 Young began his professional career in 1889 with the Canton, Ohio team of the Tri-State League, a professional minor league. The catcher who warmed up Young gave him the nickname "Cyclone" because of the speed of his fastball. Reporters then shortened the name to "Cy". "Cy" became the nickname he used the rest of his life. In 1890, Young signed for $500 with the Cleveland Spiders, which had moved up from the American Association to the National League the previous year. Two years later, the National League moved the pitcher's mound from fifty feet away from the home plate (where it had been since 1881) to sixty feet and six inches. In the book The Neyer/James Guide to Pitchers, sports journalist Rob Neyer wrote that the reason for the move was that pitchers like Cy Young, Amos Rusie, and Jouett Meekin threw too fast at the shorter distance. On September 18, 1897, Young pitched the first no-hitter of his career in a game against the Cincinnati Reds. Although Young did not walk a batter, the Spiders committed four errors while on defense. Before the 1899 season, Frank Robison, the owner of the Spiders, bought the St. Louis Browns, thus owning two clubs at the same time. Just weeks before the start of the season, most of the better Spiders players were transferred to St. Louis, including three future Hall of Famers: Young, Jesse Burkett and Bobby Wallace. Despite the changes in the team members, St. Louis finished fifth in both 1899 and 1900. The Spiders lost 134 games, the most in MLB history, before folding. In 1901, Young left St. Louis and joined the American League's Boston Americans for a $3,500 contract. Young stayed with the Boston team until 1909. 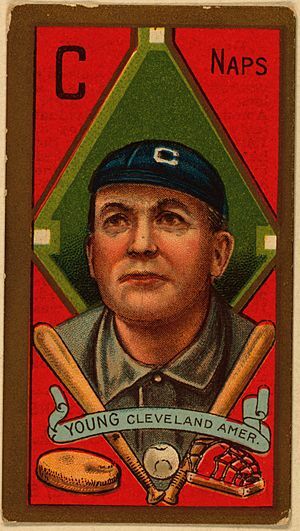 Young was traded back to Cleveland before the 1909 season, this time to the Cleveland Naps of the American League. He split 1911, his final year, between the Naps and the Boston Rustlers. On September 22, 1911, Young shut out the Pittsburgh Pirates and their pitcher Babe Adams 1-0, for his last career win. However, two weeks later, Young's 906th and final game ended badly: the last eight batters of Young's career combined to hit a triple, four singles and three doubles. A photo of Young taken in 1908 was the source for a painting that was displayed in the Baseball Hall of Fame. Young retired after the 1911 season with 511 career wins. His win total set the record for most career wins by a pitcher. At the time, Pud Galvin had the second most career wins with 364. 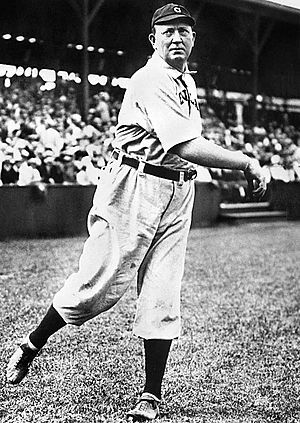 Walter Johnson, then in his fourth season, finished his career with 417 wins and is now second on the list. However, Johnson broke Young's career record for strikeouts. Cy Young's career is seen as a bridge from baseball's earliest days to its modern era. When Young's career began, pitchers delivered the baseball underhand and fouls were not counted as strikes. The pitcher's mound was not moved back to its present position of 60 feet, six inches until Young's fourth season. He did not wear a glove until his sixth. "Some may have thought it was essential to know how to curve a ball before anything else. Experience, to my mind, teaches to the contrary. Any young player who has good control will become a successful curve pitcher long before the pitcher who is endeavoring to master both curves and control at the same time. The curve is merely an accessory to control." "I never warmed up ten, fifteen minutes before a game like most pitchers do. I'd loosen up, three, four minutes. Five at the outside. And I never went to the bullpen. Oh, I'd relieve all right, plenty of times, but I went right from the bench to the box, and I'd take a few warm-up pitches and be ready. Then I had good control. I aimed to make the batter hit the ball, and I threw as few pitches as possible. That's why I was able to work every other day." Young also said that his offseason farming chores, including wood chopping, kept his pitching arm in good shape until he was 44. Even at the time of his retirement, his arm was healthy, but Young had gained weight and was unable to field his position anymore. In three of his last four years, he was the oldest player in the league. The first Cy Young Award was voted on in 1956, and was given to Brooklyn's Don Newcombe. Originally, it was a single award covering the whole of baseball. The honor was divided into two Cy Young Awards in 1967, one for each league. Cy Young Facts for Kids. Kiddle Encyclopedia.